Have fun. And, I can’t guarantee that this is bugfree, but it looks OK at a first glance. Will write in C++, use OpenGL, SDL, OpenAL. Target platforms will be Windows and Linux. I hope to cross-build for NaCl and Android later, but I wont make that before the weekend is over. This is the second post I’m making about the game I made this LD – not been very active on the blog due to the website having its problems. I did tweet a lot, though. I was very determined to do better than my previous entry this time – which I feel I have accomplished. Really happy with my tile work. This went a lot better than I had hoped. Things were in general pretty smooth. Level-design. I need to learn how this is done best. I believe that the first two rooms were decent – they did their purpose. However, the other rooms were garbage, and not clever at all. 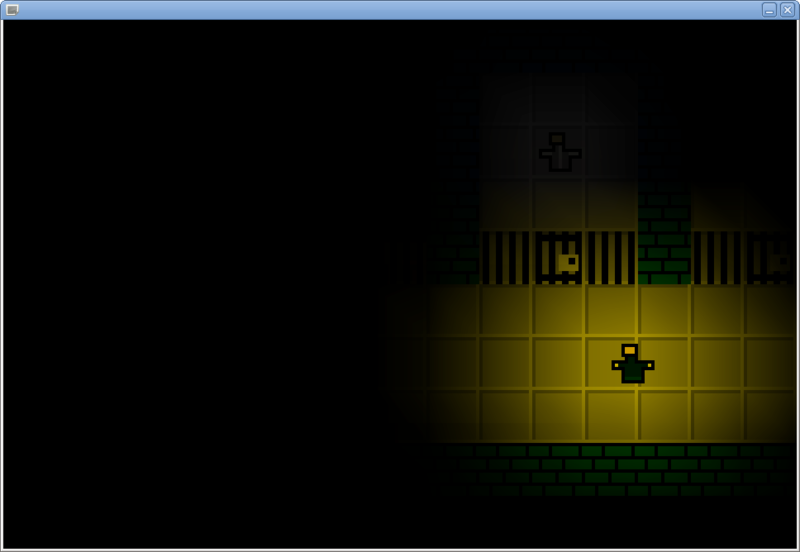 There’s no ambient light in the game – several people have complained about not being able to see the player. Giving too few instructions. I haven’t decided if this is a real problem or not — it is the kind of game where I want you to search around, and try different things. Some people didn’t bother, and some got genuinely stuck. Spriting. I gave up making nice sprites, and just left in the placeholder sprites temporary sprites I made in the beginning of the competition. I need sprite-practice. Those who completed my game have been encouraging. I think I could create a larger game, based on this idea. It’s further down the road, though – since I have other plans. Can I do better? Yes I can, just check out my performance on LD22. Got some ideas going on, but I need a break. This is what it currently looks like. So, Ludum Dare #20 is over, and voting has started. I intended to write a post where I sum up my thoughts about my own performance. But first; I want to applaud this community, for being so warm. People are encouraging, and the admins do not accept trolling. Everything is very well organized, and I can’t really see what can be done better. This guarantees for my intent to participate again next LD. I found quite a few bugs in my own basecode, that did cost a lot of time. This is a direct consequence of the basecode being made FOR Ludum Dare, and not being tested on any other real projects. Basecode lacked some features that would speed up the development. Asset management, a camera, sprite-position correctioning (to be able to easier enter doors when missing them slightly), dialogue system, a standard set of good collision detection algorithms, and probably much more that I can’t recall at once. These are all things that I intend to fix before LD21. A direct consequence of this shows in my source code, as a great pile of doodoo. I started drawing, and things turned out much better than I expected. I even had an animated main character that worked out decently well – he didn’t get to have an attack animation, though. I did manage to dedicate the time to do this. I did finish, and the game is beatable. And I’m very happy for that. Can I do better? Yes I can, just check out my performance on LD21. Half-time?! I guess a Screenshot would be in place. * Started well, friends are impressed at how well I’ve been doing. * A few hours in I started hitting various porting bugs that I had to deal with, and I started to overengineer stuff. Closer to dinner I decided that I’m going to simplify things – just make stuff work, get this done. It will definitly be a short game, but it will be a game nonetheless. Had some sleep, battled a killer-bug – and started doing some actual progress. What you see to the left, is the house our main character lives in. What you see to the right, is the dungeon of the game. Due to some limitations I’ve discovered in my tileengine, I wont make more effort at doing overworld – I’ll just design a dungeon, some puzzles and mobs, and a hopefully a bossfight – and the quest should be complete. Yes, it’s obviously a Zelda-clone. 24 queries executed in 0.107 seconds.